A great time was had by everyone that attended Ashington Festival on Saturday, apart from a small shower the weather was good and the people flocked into the Ashington Recreation Ground. The day started with a Carnival parading through the village. Leading the Carnival was Carnival Princess 2017 Isabelle Wieland age 9 with her 2 Attendants Phoebe Bush age 5 and Paige Read age 9 also her 2 Pageboys Peter Read age 10 and Isaac Wieland age 5. And carrying the Ashington Carnival banner was John and Solly Harris from the village’s own Harris Funfair. There were many excellent floats and walking groups and the overall winners from both groups were 1st Ashington 1st Scout Group as ‘Charlie and the Chocolate Factory’, 2nd place was Ashington Youth Club & Gym as a ‘Human Roller Coaster’ and 3rd place was the McGrath family with ‘100 years of Ambrosia’. ‘The Medina Marching Band’ from the Isle of Wight were the leading band supported by the ‘Boom Tribe Samba Band’ and the ‘Regis Troopers Majorette Group’. In the arena, we welcomed back the fantastic ‘Stallions of Substance’ with their beautiful stallions performing tricks, kindly sponsored by Sussex Equestrian Hospital. Then sharing the bill was the Essex Dog Display Team, displaying their skills with their brilliant dogs. And we welcomed back Tom Foolery the popular children’s entertainer sponsored by Saxon Weald. On the Recreation Ground we had the popular Harris Funfair, a Fun Dog Show sponsored by Arun Veterinary Group, a Car Boot Sale, a Classic Car Show, animals and lots of sideshows and stalls. Also a licensed bar and a Pimms Tent and lots of varieties of food. In the Community Centre was the Flower Show with beautiful flowers and vegtables , arrangements and homemade cakes and crafts. And the main act for the evening, back by very popular demand was the fabulous Paul Jackson as ‘Freddie Mercury’ who really got the crowd rocking. And we were delighted to welcome back to the Festival ‘Speedboatz’ a popular local band who were firm favourite at the Festival a few years ago. And a popular disco provided by ‘Retrospect Sound’ got everyone up and dancing. But the finale was a fantastic Firework display sponsored by Charles Muddle Ltd. The end of a brilliant day, and the Ashington Festival Committee would like to thank all the sponcers and volunteers who helped to make it such a successful day. We hope to see you all next year on Saturday 18th of August 2018. Even though the weather wasn’t at its best this year, the crowds still came out in force for a fantastic day out at the Ashington Festival. 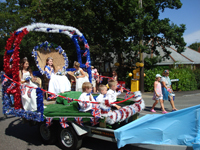 The Carnival Procession travelled through the village lead by the 2016 Carnival Princess Amber Loisy, her attendants Lois Comer and Isabelle Fraser and her pageboys Todd Geal and Oliver Fraser. The Medina Marching Band really set the tone and pace at the front whilst Boom Tribe Samba Band brought the rear. In the middle came a variety of Carnival Floats and Walking Groups along with a collection of vintage vehicles. The overall winners were “The Punk Shoppers”, the most disreputable group you’ll ever see! Other winners included “Rio/Olympics Carnival” and Chanctonbury Playschool’s Old MacDonalds Farm. As the Carnival entered the Recreation Ground there was entertainment for everybody, including Harris Brothers Funfair, a fun Dog Show sponsored by Arun Vets, a car boot sale and rows of craft and charity stalls selling some beautiful things. The Flower Show was, as always, held in the Ashington Community Centre had some wonderful exhibits of flowers, vegetables and craft items all to a very high standard. As always there was a licensed bar and a wide variety of foods available catering for all tastes including delicious wood fired pizzas and authentic Thai street food. In the middle of it all was the fantastic stage and arena with acts through the afternoon and evening. Welcomed to the arena for the first time was Joseph Peace with his high octane Red Hot Fire Stunt Show, Ringside Lurchers & Falconry Display, and the always brilliant Tom Foolery. by popular demand and a terrific Elvis Presley impersonator. The music and dancing carried on to the end of the evening with the ever popular disco. Just after 10pm there was a fantastic firework display which lasted about fifteen minutes and was a real highlight to a great family day out. The Festival Committee would like to thank all the sponsors and everyone that helped on the day. See you again in 2017 on Saturday 19th August !! On a beautiful sunny day the crowds came out in force for a fantastic day out at the Ashington Festival. Taking part in the parade were some fabulous Carnival Floats and Walking Groups. The overall winners were the The Ashington Minibus Group as “Fifty shades of Grey” and we’re delighted to see their entry caught the attention of the books author herself!. Other winners included Hillcrest horses with their brilliant Mr Men entry and Chanctonbury Playschool as the hungry caterpillar. A stilt walker, the Medina Marching Band and vintage vehicles made up a colourful parade. As the Carnival entered the Recreation Ground there was entertainment for everybody, including Harris Brothers Funfair, a fun Dog Show, go karts, inflatables, car boot sale and rows of craft and charity stalls selling some beautiful things. The Flower Show held, as always, in the Community Centre had some wonderful exhibits of flowers and vegetables and craft items all to a very high standard. In the middle of it all were our fantastic stage and arena with acts through the afternoon and evening. We welcomed back Jez Avery and his high octane stunt show, Wild West act “The Texans”, and the always brilliant Tom Foolery who also performed his brilliant new act “Dressage-Foolery” with his horse Bailey. As the sun went down “Absolute 70s” got the party started followed by a terrific tribute to Michael Jackson from Danny Oliver. The music and dancing carried on to the end of the evening with some popular tunes from “Absolute 80s” and our always popular disco. With a fantastic firework display, a wide variety of foods available and a licensed bar, it all added up to a thoroughly enjoyable day. See you again in Saturday 20th August 2016 !! Saturday saw hundreds of people lining the streets of Ashington as Horsham’s Boom Samba band led the Carnival parade through the village on the way to the 2014 Ashington Festival. 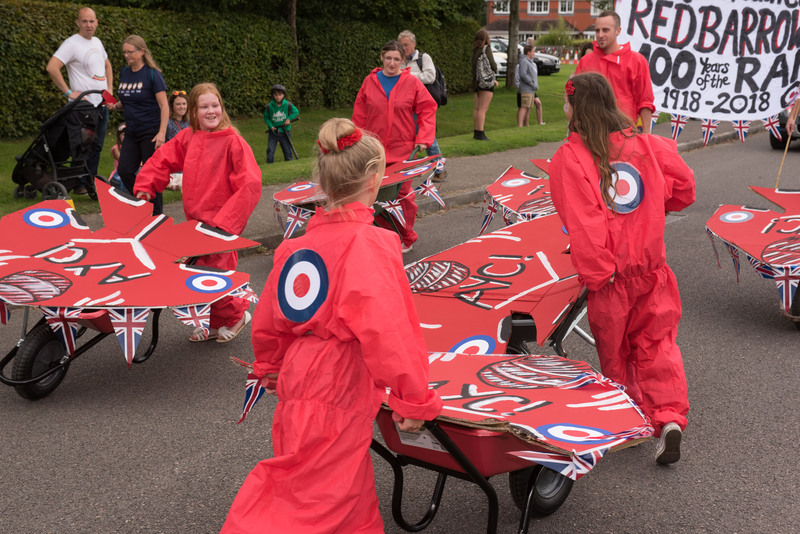 Over 20 colourful floats and walking groups formed the parade which also included dancers, bands and vintage vehicles. Extra entertainment provided along the route ensured a fantastic party atmosphere amongst the crowds as they waited for the parade to pass. The Carnival finished on the Playing Fields where Festival goers were treated to a full programme of entertainments throughout the afternoon and evening. The winner of the carnival floats were the MacKinnon family with “The Greatest Show on Earth” and the winner of the walking groups were the Hillcrest Horses with “The Lego Movie”. The arena was home to fabulous animal acts “Olivants Equine” and “Flying Falcons” as well as children’s entertainer “Tom Foolery” and local teenage band “Route 42”. As the sun began to set a fantastic music show began led by the wonderful “Silver Beatles”, tribute band “Curves Aloud” and Sussex band “Speedboatz”. Comedy was provided by Britain’s got Talent act “Drew Cameron”. All of this together with Harris Brothers Funfair a fun dog show, classic cars, market and charity stalls, car boot sale, flower show and miniature railway and at 10pm was a fantastic firework display which added up to ensure that the 2014 Festival was one of Ashington’s best and most successful ever. We look forward to seeing everyone next year on the 15h of August. 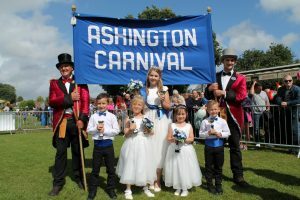 The Carnival procession starts at 1.30 and follows a route through Ashington village to finish on the Recreation ground. 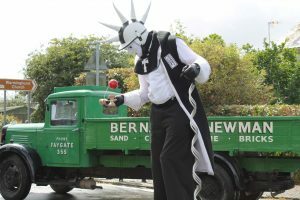 The Festival which follows includes a large stage with live acts performing through the afternoon and evening, including tribute acts “The Silver Beatles” and “Curves Aloud” and “Britain’s Got Talent” impressionist and comedian Drew Cameron. Also featuring will be animal acts, children’s entertainers and circus performers. There will also be a Car Boot Sale, Classic Cars, Flower Show, Fun Dog Show, Funfair, animals and lots of stalls and sideshows. 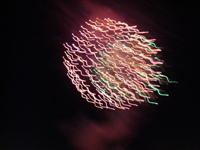 And in the evening a fantastic firework display at 10pm. For details phone Margaret on 01903 892633 or visit our website at www.ashingtonfestival.co.uk. Despite the rain, the crowds still came for a fantastic day out at the Ashington Festival. The day started with the Carnival procession travelling through the village lead by some members of the committee dressed as Zulu warriors, they were followed by the 2013 Carnival Princess Matilda Richardson and her 2 Attendants Amber Teanby and Katie Lightbody. And her 3 Pageboys Lewis Nicholls, Douglas Murray and Alfie Lightbody. as Peter Pan and 3rd was the Ashington Scouts with a float made as a lifeboat for the RNLI ? Among the entries were marching bands and majorettes making a colourful parade. As the Carnival entered the Recreation Ground there was a lot of entertainment for every age group, including Harris Brothers Funfair, a fun Dog Show, car boot sale and rows of craft and charity stalls selling some beautiful and interesting things. In the Community Centre was the Flower Show with some wonderful exhibits of flowers and vegetables and craft items all to a very high standard. The entertainment didn’t stop there as there was arena and stage acts through the afternoon and evening, starting with a jazz band and other acts were a high wire act a children’s entertainer a blues singer and the Abba Girls got the evening started, then came the act everyone was waiting for the Freddie Murcury tribute act back by popular demand from last year, the music and dancing carried on to the end of the evening with the popular Speedboatz group playing music through the decades. With a fantastic firework display and a variety of foods available and a licensed bar, everyone that came although wet thoroughly enjoyed themselves. 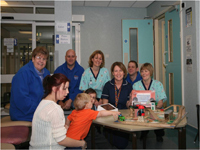 Worthing Hospital Children’s Unit received a late christmas present in January when members of the Ashington Festival team turned up to present them with a bundle of tablet PCs. The festival team had been made aware of the need for the machines at the hospital to use as a distraction tool for children undergoing uncomfortable and unfamiliar procedures such as blood tests and were only too happy to provide them. For their part the hospital passed on a huge thank you to all the people of Ashington who support the festival and make things like this possible. The ward staff were keen to get the iPad and Meep tablets into action straight away and warned that all 3 machines will be in for a busy time ! 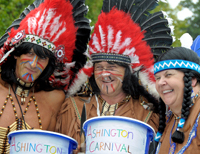 Ashington Festival has been running for over 15 years now and always seeks to give it’s profits back to the local community in the form of grants to local clubs and charities. This year the festival had already provided grants to the Tiny Tots group for play equipment, to the wardens for equipment to set up the lunch and bingo clubs, to the community centre for new seating and to the horticultural society for new banners but the chance to make life a little more comfortable for these kids was too tempting to pass up ! This year the festival will try something a little different as we choose a partner charity to work with and details of this plus the rest of the day will be regularly updated on www.ashingtonfestival.co.uk. Don’t worry though we intend to ensure our grants will still be available to all village groups too. The photo shows Ashington Festival team members handing over the new kit to nursing staff and patients at Worthing Hospital. Patients Lilia and Ashley were the first to get their hands on the little computers. The Ashington Festival 2012 had the very best weather possible and the crowds turned out in full force. There were a huge number of stalls, a car boot sale, the Harris’ Funfair, a dog show, the carnival procession and new for this year a superb stage with some fantastic entertainment. Carnival Princess, Sarah Shaw, and her attendants lead the procession followed by Horndean Marching Band and a whole host of floats including 1st Prize Winners Chanctonbury Playgroup for their incredible float “Willie Wonka’s Chocolate Factory” and The Newland Family for their Walking Group “Wallace & Grommit At The Olympics”. Runners up included Ashington Church, Ashington Scouts, Toby’s Toy Landrover and Bloomin’ Gorgeous. What looked like thousands of people then gathered on the Ashington Recreation Ground to enjoy the fabulous sunshine, superb food, cool drinks and the all new stage show – a first for the village! The Band of the Royal British Legion started things off; and with prizes for procession winners handed out by Fowlers Estate Agents, were followed by an amazing “Rat Pack” tribute by Ian Barnes. Robbie the Magician delighted the audience with a great show of magic tricks and Diane James, the Bournemouth Bombshell, charmed the crowd with some beautiful songs from the 50’s, 60’s and 70’s. The Gorgeous Miss Jason, one of South East’s best loved Drag Performers, was on fine form and managed to keep things naughty but very nice chasing some “very nice boys” around the field. The headline act was Laura White, sponsored by David Wilson Homes, who appeared in the X-Factor in 2008. She belted out a number of songs from her new album, due to be launched in the UK soon, and went on to sign a whole load of autographs for waiting fans. As the sun went down the huge crowd was then blown away by Paul Jackson who paid brilliant tribute to Freddie Mercury and had most of the spectators up on their feet and chanting along “Day-O”! He was a hard act to follow, but Aloud Out put on a truly dynamic set covering some favourites in fantastic style, taking the crowd with them all the way to the Fantastic Fireworks, kindly sponsored by Charles Muddle Ltd.
An amazing day, unique for West Sussex, all made possible because of the kind sponsorship of The Co-Operative, Northover Fuels, The National Farmers Union, Winner Plant Hire, Class Technology Solutions and many others. The Festival was a huge success and the Festival Committee would like to say a huge “Thank You!” to everyone that helped on the day with our biggest turnout ever and an amazing atmosphere! Roll on 2013! A “fixture clash” led to a slightly disappointing turn out for the Village Golf day this year. Those golfers who did play though were rewarded with a challenging round on a sunny and windy day. Scoring was not easy and the tricky ups and downs of the Hill barn course were waiting to catch out any wayward hitters. With a score of 34 points, excellent scoring in the conditions, the day was won by Mrs Anne Roberts. 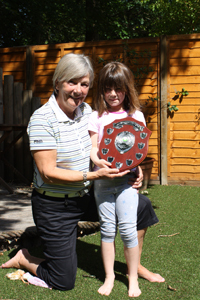 At the end of the competition her grand-daughter Holly was on hand to present Mrs Roberts with the trophy. Great fun was had by all when Ashington Carnival Princess was chosen at a Children’s Disco which was held in Ashington Community Centre. The Disco was very well attended and everyone had a fantastic time dancing and joining in the dance competitions which was organised by Just 4 Kids Disco. There was a raffle, a tuck shop and some refreshments for the adults. The Judge was a member of staff from Fowlers Estate Agents who said it was not easy as there were so many children to choose from and they were all special. 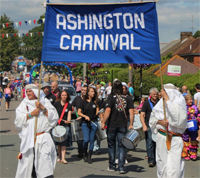 Ashington Festival is being held on the 18th of August, with the Carnival starting at 1.30pm. The day includes a large stage with live acts performing through the afternoon and evening, including an X Factor finalist in 2008, Laura White. There will also be a Car Boot Sale, Classic Cars, Flower Show, Fun Dog Show, Funfair, animals and lots of stalls and sideshows. And in the evening a fantastic firework display at 10pm. For details phone Margaret on 01903 892633 or visit our website at www.ashingtonfestival.co.uk. 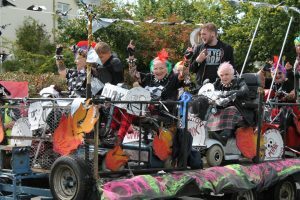 After a successful Festival this year, the Festival Committee wrote to village groups and organisations offering a grant to buy any equipment they required. Ashington Horticultural Society was awarded £96 for 2 banners to advertise their Open Gardens Weekend in 2012. Ashington Tiny Tots was awarded £175 for new play equipment. Ashington Community Centre was awarded £238.80p to replace a broken router for the access system. Ashington Scouts was awarded £500 toward a large push up marquee. The sun shone on Ashington Festival this year, and thousands of people came along making a fantastic day and a real community spirit. 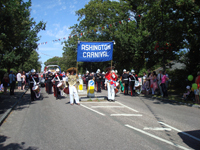 The Carnival was one of our biggest with a lot of floats and walking groups, majorettes, belly dancers, vintage vehicles and lots of people in fancy dress. And didn’t our Princess and Attendants look beautiful and her Pageboys very handsome. 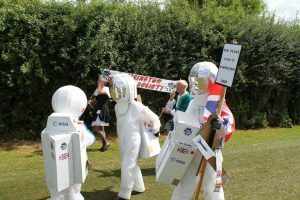 The Best Float was won by Chanctonbury Playgroup and the Best Walking group was won by Alfie’s Formula One Racing Team and the overall winner of the two groups who won the £100 prize was the Chanctonbury Playgroup, well done to them. The winner of the Fancy Dress was Cruella De vil, Annie Francis. The Recreation Ground was full of all sorts of stalls, animals and sideshows and Harris Brother’s funfair. The main arena act was a brilliant mountain bike stunt display team who stunned the audience with their dare devil stunts. In the evening the atmosphere carried on with a live band and disco outside, and a fantastic firework display, one of the best yet, which marked the end of a brilliant day. 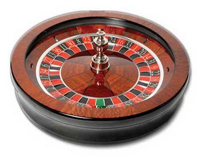 The Festival Committee have written to village clubs and organisations offering them small grants for equipment for their groups as they wish to support village activities. We would like to say a big thank you to all our sponsors and to everyone who worked hard to help us on the day, making it a great success that it was. And we hope to see you all next year on the 18th of August 2012. Fun was had by all when Ashington Carnival Princess was chosen at a Children’s Party/Disco which was held in Ashington Community Centre. The Party was very well attended and everyone had a good time dancing and playing games which was organised by Just 4 Kids Disco. There was a raffle, lucky dip, glow sticks plus a tuck shop and some refreshments for the adults. The Festival Committee would like to extend its thanks to all of those who took part in this year’s golf tournament which was once again superbly masterminded by Tony Harvey. There were 19 avid players on the day and by all accounts everyone had a fantastic time. 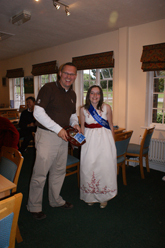 The winner this year was Steve Burston and you can see a photograph of him receiving his prize from last year’s Festival Princess, Chloe Ball. We are also pleased to announce that the day raised a total of £121.31 for the festival fund, making sure once again that our village has a carnival that is the envy of Sussex – thanks to Tony for all his hard work! Despite the rain Ashington Festival was as big as ever this year. Starting with a large Carnival procession leaving the top roundabout, north of Ashington at 1.30pm. Holding the Carnival Banner was Dave Alford and David Jackson in Cowboy and Indian costumes. ‘The Surrey Pipe Band’ was the leading band for the procession followed by the Carnival Princess and her two Attendants and two Pageboys. There was a lot of colourful floats, bands, majorette troops also vintage vehicles, clowns and lots more. The Festival was held on Ashington Recreation Ground, Church Lane which started at 2.30 pm after the arrival of the Carnival procession. There was arena events with the main act being Stallions of Substance an act that combined sisters, stallions and a little brother on a motorbike the act included humour, stunts and the obvious love and trust between horses and riders. The Wessex International Majorettes danced a dance routine, also ‘Charlie’ the clown was there with lots of children’s entertainment. In the Community Centre was the Flower Show where you were able to see a beautiful display of vegetables, flowers and craft items all at a very high standard. On the Recreation Ground we had Harris Brothers fun fair, a car boot sale, side-shows, craft and charity stalls, a children’s farm with lots of animals to see and also ferrets and Bungee Trampolines. Near the Recreation Ground was an American and British Classic, Hot Rod and Custom Car Show. Also there was a Fun Dog Show. As we carried through into the evening we had a live band playing outside, who were back by popular demand ‘Creative Covers’ they played music through the decades to present time. And at 10pm there was a fantastic Firework display, which marked the finale of a successful day. Ashington Carnival Princess was chosen at a Childrens Party/Disco which was held in Ashington Community Centre. The Party was very well attended and everyone had a good time dancing and playing games which were organised by Retrospect Sound. There were Lucky Dips, ‘Tattoos’ and glow sticks, plus a tuck shop, and some refreshments for the adults. 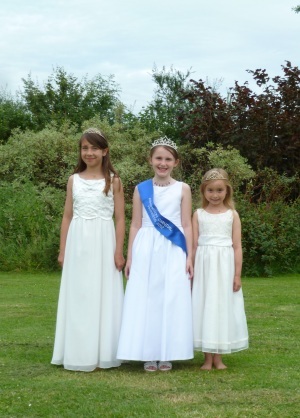 The Ashington Carnival Princess 2010 is Chloe Bull aged 11, and her two Attendants are Amy Burroughs (aged 10) and India Manville, aged 9. The two Pageboys are Cavan Sopp (aged 7) and James Newland, aged 5. All of them attend Ashington CofE Junior School or Rydon Community College. Fowlers Estate Agents is one of the major sponsors of Ashington Festival this year, and two of their staff judged the Carnival Princess contest. Wendy Menzies complained jokingly that it had been a really difficult task, as there were so many children, and they were all so lovely! 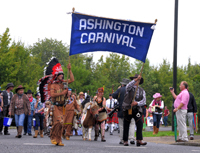 Ashington Festival 2010 is being held on the 21st of August, with the Carnival Procession starting at 1.30pm. The day includes Arena acts, Car Boot Sale, Car Show, Flower Show, Fun Dog Show, Funfair, animals and lots of stalls and sideshows. The fun continues right through the evening, with a live band playing outside and a fantastic firework display. For details phone Margaret on 01903 892633 or visit our website at ashingtonfestival.co.uk. Food for the evening was by Gastro Catering (a fabulous Hog Roast) and the gaming tables were supplied by Big Deal Entertainments. The only bad news on the night was the fact that only 65 villagers attended so the fund-raiser made a loss. Saturday 1st May saw the second ASHINGTON Festival Golf Day.